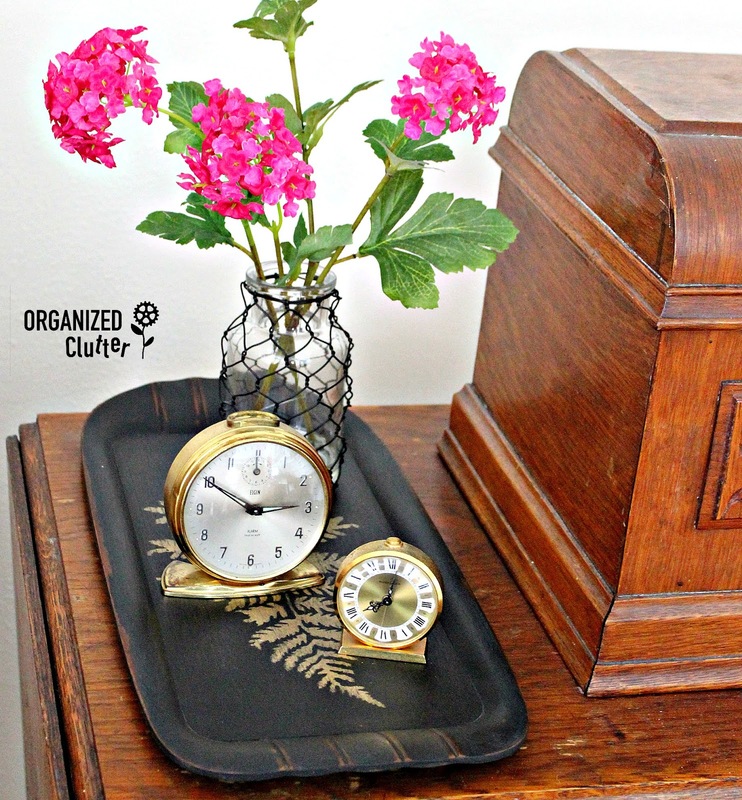 I found these two vintage trays at the thrift shop last week. 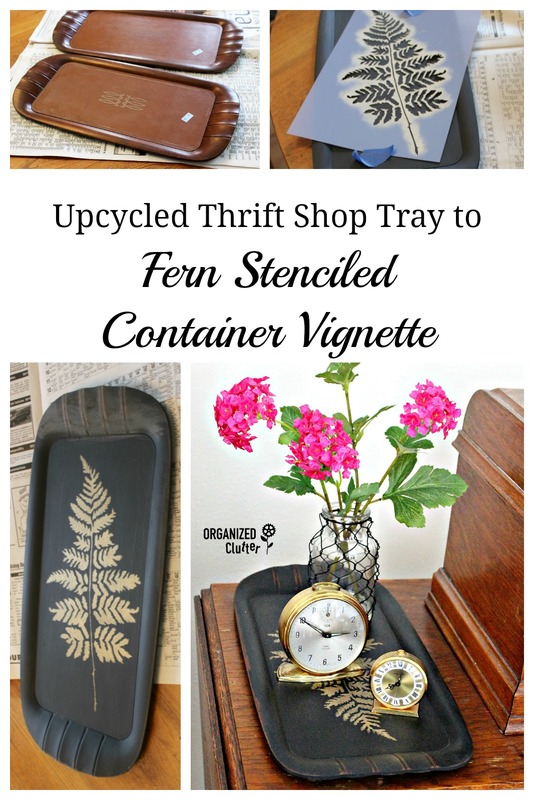 I up-cycled one of the trays, and used it in a container vignette. The trays were priced right at 59 cents each. I'm sure the trays are considered Mid Century. The lap trays were sold by Toastmaster, McGraw Electric Company. I painted my tray with two coats of Dixie Belle Chalk Finish Paint in CAVIAR , using one of my Zibra brushes. I painted both the top and bottom of the tray. I picked up a trial size of Rust-Oleum Metallic Accents Paint in Soft Gold recently. I used this water based paint for the first time on this tray. 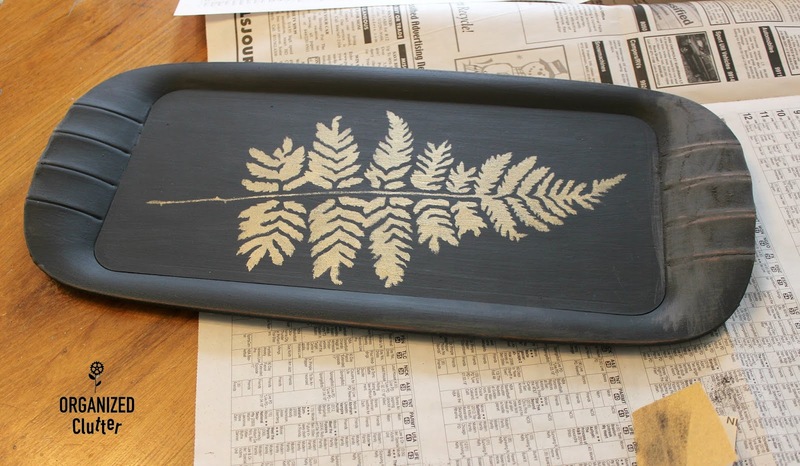 I taped my Hobby Lobby Fern Stencil onto the tray using blue painter's tape. Here is the tray with the soft gold metallic stencil. I sanded the entire tray with 220 grit sandpaper, applying more pressure to the edges and detail. I applied a very light coat of Dixie Belle Best Dang Furniture Wax in Clear with a Intex Pfc Precision-fiber Paint & Cleaning Rag . I used a second rag to wipe down the tray after the wax was dry. The Dixie Belle Paint Company's website has great videos, instructions and FAQ's on all of their products. 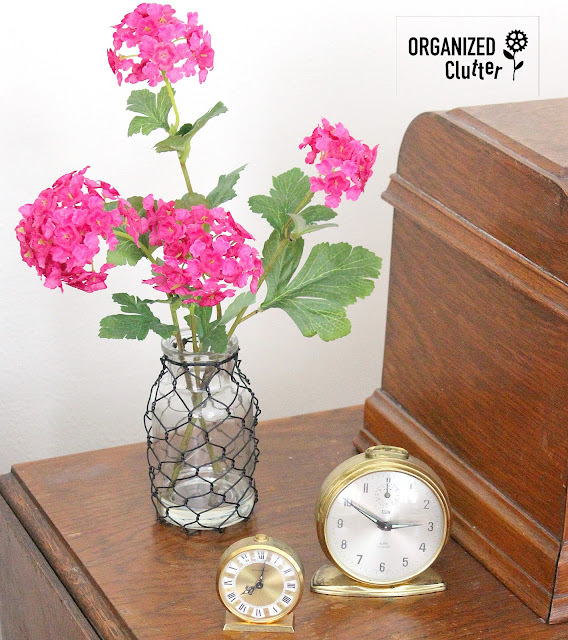 The vase and the two vintage clocks are sitting on one side of a vintage sewing machine in my living room. AND here are the same three items displayed on my newly up-cycled vintage tray. The tray fit the space perfectly too! I like the grouping much better contained! 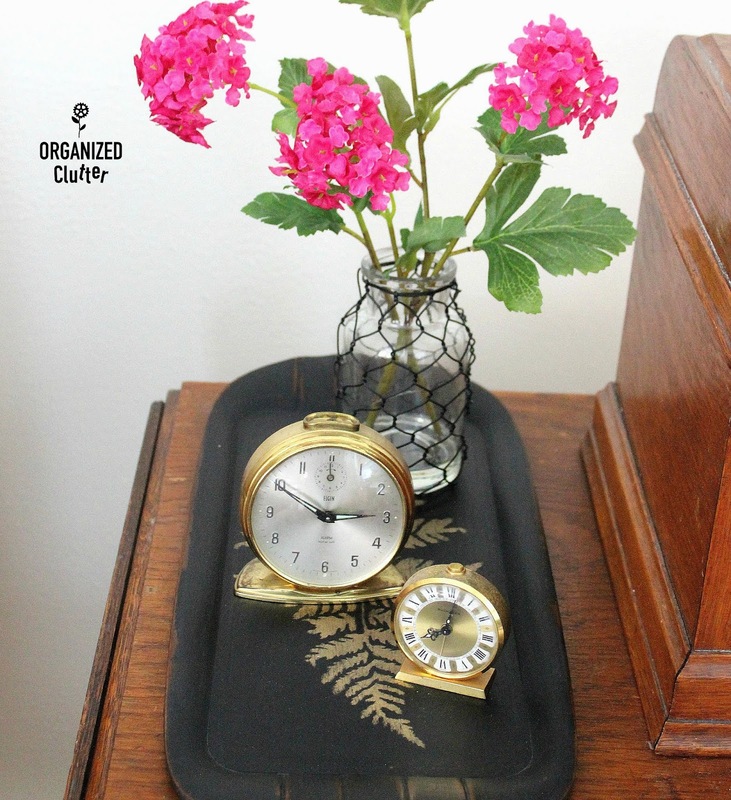 I like the gold leaf stencil with the vintage gold clocks. 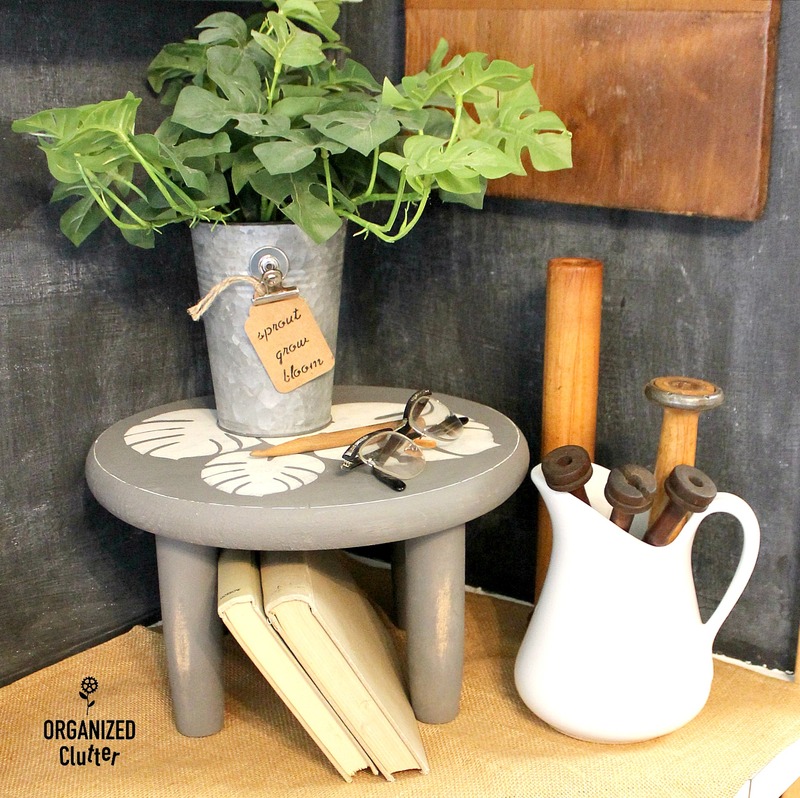 More container vignette ideas to come! Are you a fan of container vignettes? Another recent vignette arranged using a riser/stool to add interest. I love these little trays! i use them as magnet boards most often. I'm not sure if yours is metal, it looks like wood. Regardless, you vignette does look nicer on the tray!